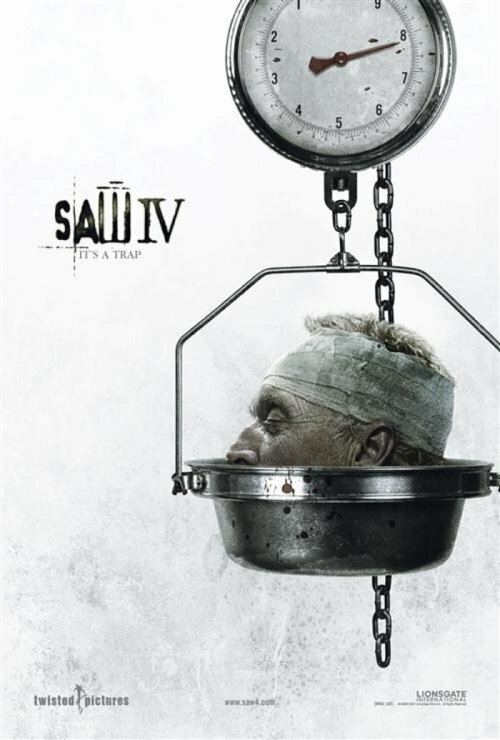 Just a few days ago I was commenting that I liked that the last SAW poster didn’t try to somehow squeeze a 4 into the image. And now this new poster is released. I swear I think they did it just to spite me. All kidding aside, it turns out that they actually managed to make the four work well. I was fearing that it would be too close to something like this, but it wasn’t. I also have to say that, for some reason that I can’t explain, the medical instruments with bits of flesh stuck to them are creeping me out way more than the body parts generally do. So that is also nice. But in the end the problems with this are much the same as the problems with the last one. The poster is great by itself, but at this point it feels like something we have seen before. When it comes to anything related to Tim Burton’s work we can generally expect something dark and a bit weird, but also with a strange sense of humor to it. 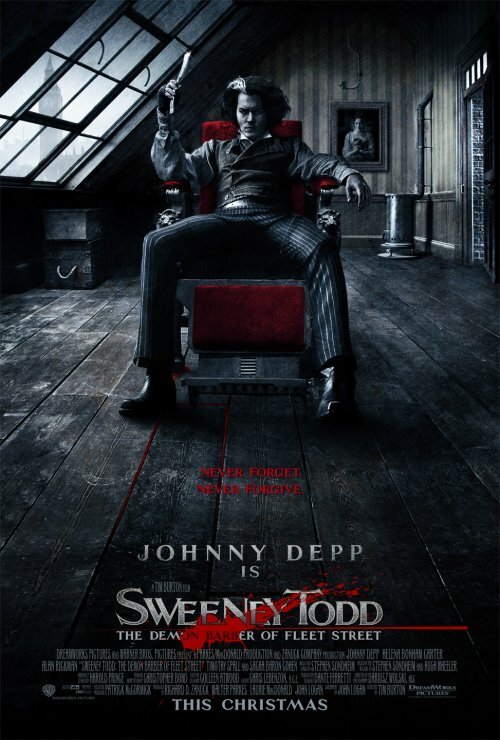 This poster for Sweeney Todd mostly lacks any humor at all. But otherwise it fits. It’s very dark, not only in it’s color but also in the mood it transmits, with the few splashes of blood red making it especially creepy. And it looks quite weird, both in the visual style which makes the image look like a very realistic drawing and in the choice of setting and of “camera angle”. Johnny Depp gets prominent placement in the poster, which is to be expected. After all he plays the title character and is the main draw in the film, from a marketing perspective. And I have to say, his expression adds a lot to the poster. Even in a still he is still able to transmit so much with his face. Impressive. I’m sure many people will will be a little repulsed by the darkness of this poster. Me? Well, I’m more interested than ever in the movie. 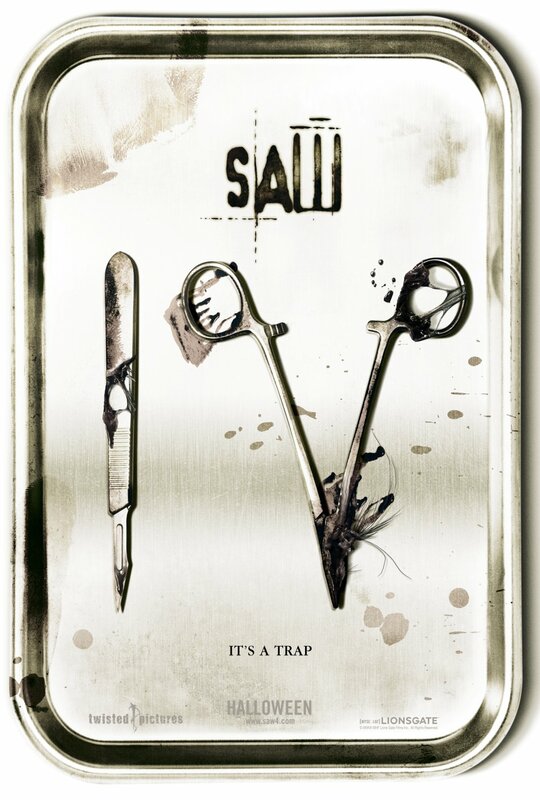 The general look of the SAW posters has always been pretty consistent, and this new one is no different. The main departure we have here is that the featured body part is a very recognizable head. In the posters for earlier installments of this series the body parts were always anonymous, so to speak. They really could belong to anybody. They also didn’t try to somehow put a four in there this time, which I think is well advised. That kind of thing could end up slipping into self parody way too easily. It’s a nice, gory poster. But at this point it’s basically more of the same. 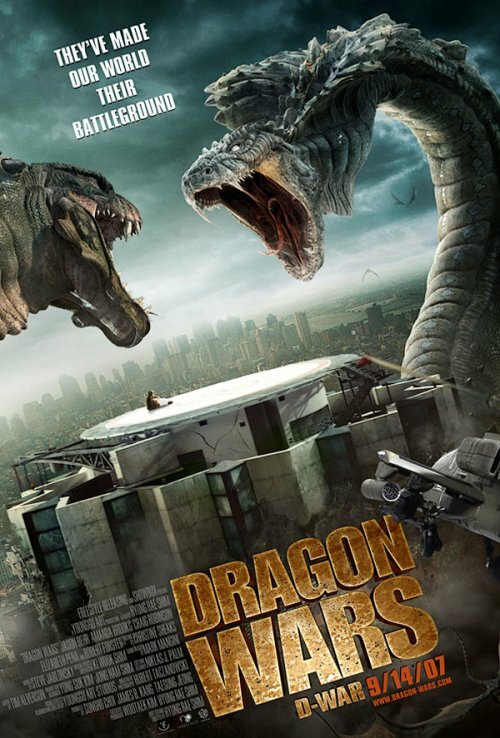 Via ShockTillYouDrop we have the first American poster for Dragon Wars (or D-War). It’s very similar to the third Korean poster we covered here, with a few key differences. The first is that we have the introduction of another monster, and together with it comes the idea that this movie focuses on a battle between these creatures. That is reinforced by the tagline. The second difference is that we know have an helicopter entering into the battle. I imagine that the idea here is to make the movie seem more action packed. The third difference is the change in the title’s design. As a matter of fact the title has been also changed from D-War to the more on the nose Dragon Wars. And the fourth difference is that the colors are a little brighter in the American version of the poster. Honestly, I dislike these changes. I think they mostly take away from the simple appeal of the giant snake attacking Los Angeles. And much like it happened with the American version of the poster for The Host, they make the movie seem cheesier. Too bad, because I really liked the Korean version. Now this is something different. 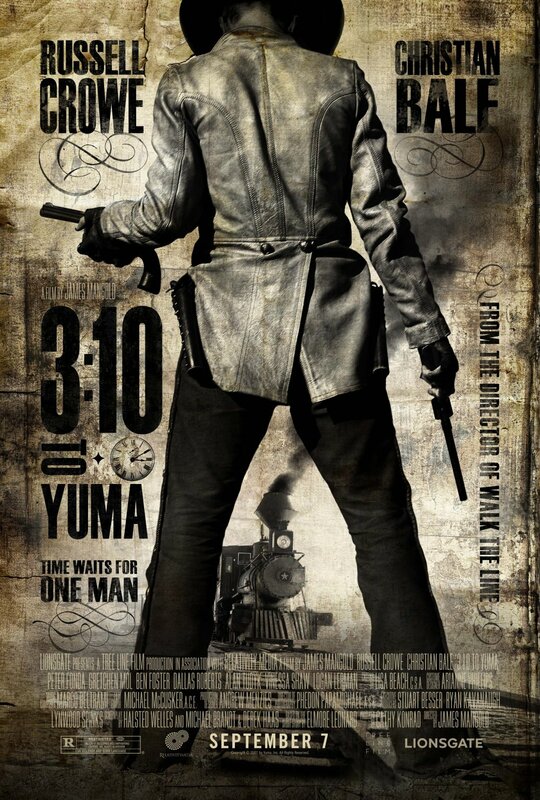 The new 3:10 to Yuma poster is quite beautiful, and remarkable in several aspects. The first being that it doesn’t show the faces of the two top actors, something that is unusual considering that both Christian Bale and Russel Crowe are so well known. It’s also remarkable for using a very stylized, almost drawing like look. This coupled with all the effort that is made to make the poster look old and a beaten up gives the whole thing a very “old time western” feel. It’s almost nostalgic in a way. Like I said, beautiful. And it certainly grabs your attention. Overall a very interesting choice.